I'm all about traveling efficiently — and a great way to do that is by savoring local cuisine as you soak up the splendor of the place you came to see. While view restaurants often come with a steep price tag, I've learned to find scenic places to eat where the food is delicious, affordable, and memorable. You might call taking in the view while you eat "killing two birds with one stone," but in Scandinavia, it's "killing two flies with one swat." This past summer, I "killed two flies" in the fascinating Swedish town of Kalmar, which has a wonderful beach at the edge of its Old Town on the Baltic Sea. On a hot summer day, I found a festive and happy slice of Swedish life, with views of the town's medieval castle, as well as of castles built of sand. With a snack-stand meal in hand, I walked to the end of a long pier to take in more views — plus some exuberant kid-leaping-into-water action. The combination Swedish beauty pageant/tattoo show on shore made for great lunchtime people-watching. 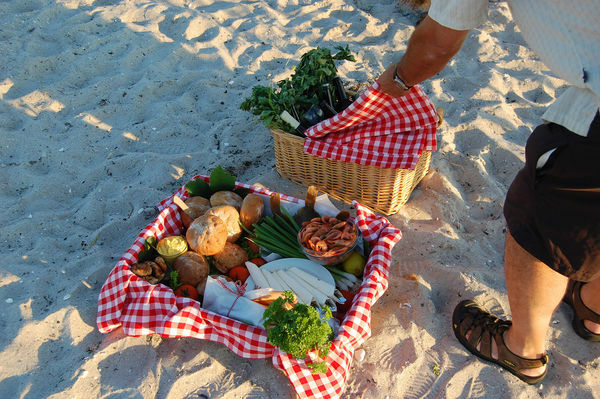 Picnics are a smart, budget-saving strategy anywhere in Europe. Convenience stores are abundant, but while cheaper than any restaurant, they charge about double what you'll pay in a grocery store. At a European supermarket, I can get a big, cheap bag of almonds to munch on. A bag of carrots for snacking can last for days. Yogurt is drinkable, cheap, and tasty. A box of juice costs about $2 (always look for "100%" — easy to spot in any language — or else you'll get a sugary "juice drink"). Market halls come with great eateries, priced for local shoppers and serving the freshest of quality ingredients. With your favorite munchables, set up on a scenic stretch and enjoy a world of entertainment with postcard views. In Spain, the San Nicolas terrace across from the Alhambra palace in Granada comes with great Roma (Gypsy) music nearly all day long. Pop a few euros into the musicians' hat, sit down with a yummy picnic, and enjoy an open-air concert as good as many you might pay for. 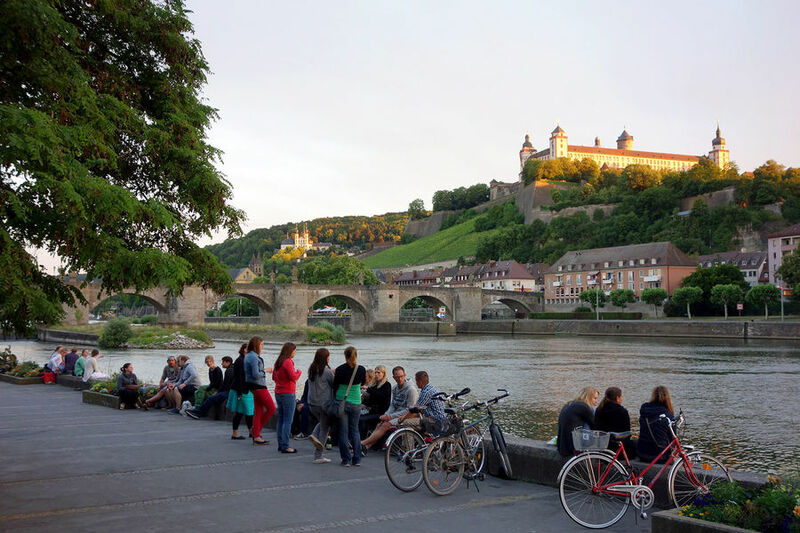 In Germany's bustling Würzburg, commune with beer-drinking students on a park-like riverbank that stretches from the city's atmospheric old bridge, with the stout Marienberg Fortress looming overhead. There are plenty of benches and a long, inviting, concrete embankment to spread out your meal. Even in the most resorty of places, such as Italy's Amalfi Coast, you can always find a rosticceria, where classic local dishes are cooked up and ready for you to buy by the weight. I don't know a lot of Italian, but a key phrase I do know is da portare via — "for the road." Take your meal down to the beach, grab a nice perch, and enjoy a Mediterranean vista. In Paris, assemble an evening picnic in the food shops along Rue Cler, and set up on the riverside promenade for a très romantique meal with floodlit views of the Eiffel Tower. If you're willing to pay a premium, dining with a view is at option at restaurants, of course — but choose carefully. 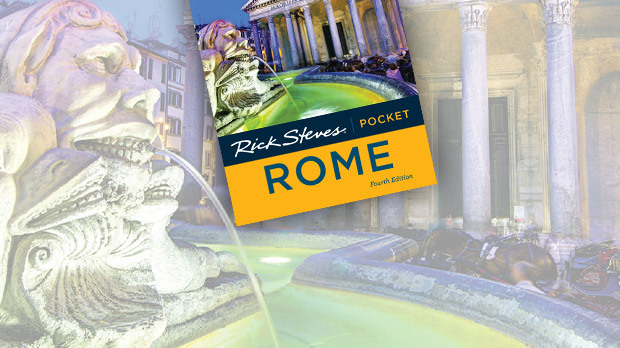 Europe's most fabled nightspots, such as Rome's Piazza Navona, are lined with outdoor restaurants that come with enticing menus and formal-vested waiters. I like the idea of dining under floodlit monuments amid a constantly flowing parade of people. But throngs of tourists and forgettable, overpriced food can kill the ambience — consider enjoying the view by ordering just a drink or dessert. If you're set on eating a whole meal at one of Europe's outdoor hot spots, circle slowly and observe the food and people carefully. Places with happy diners are your best bet. Top-floor dining with views can be more challenging on the wallet, but there are affordable options. All over Europe, towering department stores offer great cafeteria lunches — with rooftop views at no extra charge. Switzerland can be expensive, but savvy diners in Luzern head for a self-service cafeteria on the fifth floor of the Manor department store, and then climb some stairs to an outdoor terrace. You munch looking over the rooftops to Lake Luzern and Mount Pilatus. The terrace gets packed with locals at peak times — eat early or late, and send your travel partner up top to claim an outdoor table while you buy the food. Even hotel bars can be worth a splurge. In Amsterdam, enjoy an appetizer or drink in the Doubletree by Hilton's rooftop lounge while you take in the best "high-wide" view of the city. 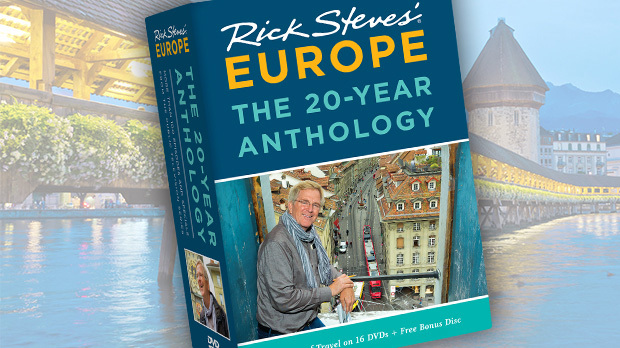 It makes sense to savor a place's national dishes along with its national scenery. Travel makes life simply more tasty, and views can make your dining even more unforgettable.